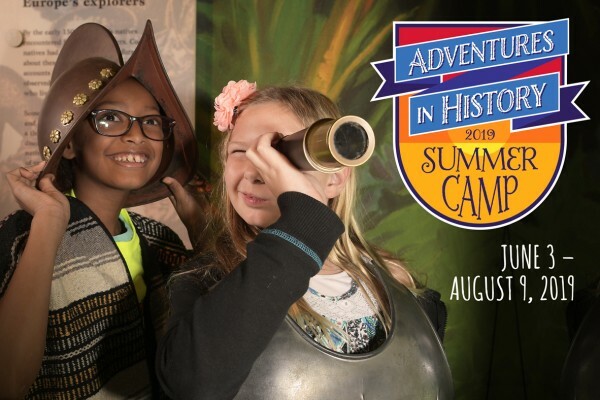 History and fun collide at our Adventures in History summer camp program. We provide a safe and fun learning environment that combines cool historic facts with STEM content through hands-on activities, interactive guest-speaker programs, and exciting field trips. Campers will discover the history that surrounds us every day! We offer three classes divided by age group (1) ages 6-7, (2) ages 8-9, and (3) ages 10-11. Download our 2019 Adventures in History Summer Guide here. Morning care: 7:30 a.m. – 9 a.m.
*A fee of $1.50 per minute will be charged per child after 6 p.m.
Buy a family-level membership for as low as $55 to receive $25 off per week of camp. Early Bird prices offer members a chance to save an extra $25 per week for a total of $50 in savings. Plus, enjoy a year of free admission to the History Center for the whole family, discounts on programs, and invitations to special events! February 15 – April 15 Extended to April 22! Note: Orange County Government employees receive the same discount as History Center members; call 407-836-8580 for details. Click on the camp of your choice on the chart. A new page will open with the camp date and age level. History Center members should sign in or register on the site at this point. Fill in the quantity field – if you have one child, enter 1, for example – and click on the “Register” button. The full price will first be shown on the form, but early-bird and History Center member discounts will automatically apply before you complete your transaction. 2 June 10 – 14 To Orlando & Beyond! To Orlando & Beyond! To Orlando & Beyond! 5 July 1 – 3* Order in the Court! Order in the Court! Order in the Court! *Camp will be closed July 4 and 5. Pricing for July 1-3 is prorated to reflect a 3-day week. If you’re registering a child or children for multiple camps, simply return to the chart and choose each camp separately. Click on the camp you desire and repeat Step 1. Near the top right corner, you’ll see an option to auto-fill information from previous registrations. You’ll need to repeat the registration-information process for each additional camp. When registration is complete for all camps, click on “Update Cart” and check out. Refunds are issued if the cancellation is requested at least 10 business days prior to the start of the camp session. A $20 administrative fee will be deducted. Camps may be rescheduled at no cost if space is available; if classes are at max capacity, the refund policy applies. There are no partial refunds for missed days of camp. Field trips may use various modes of transportation including walking, the SunRail train, and buses. Join us for a camp open house on Saturday, May 11, to view classrooms, see the drop off/pick up area, review curriculum samples, meet camp teachers and education staff, and get excited about Adventures in History! The History Center will offer free admission during open house from 10 a.m. to 2 p.m. No registration is required for our camp open house.